The AFCO-based radiator (see below for part numbers) installed as of June 2013. 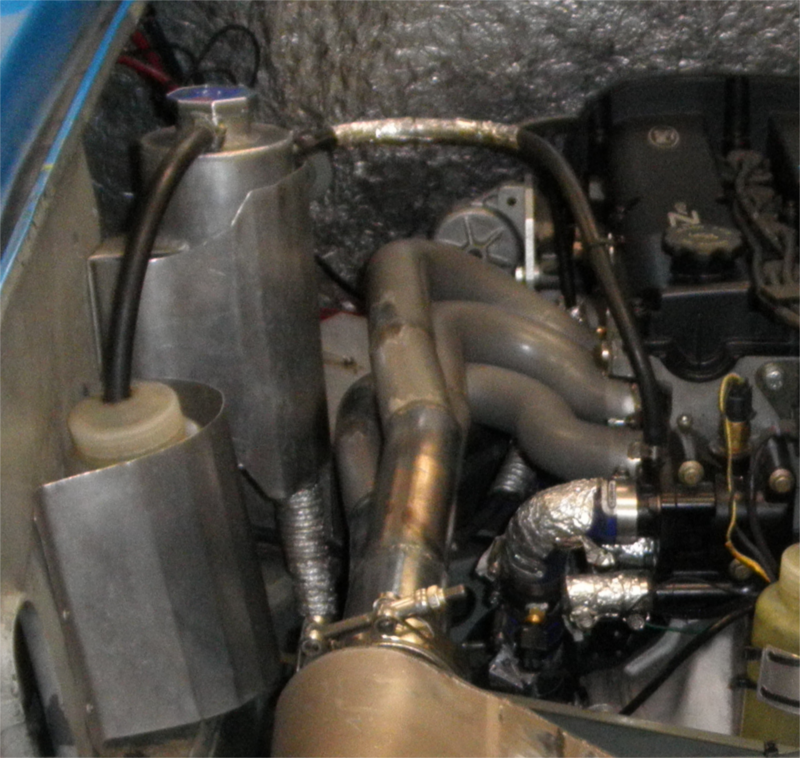 There was a major fiberglass project to mount the radiator with its Davies-Craig pump and a significant revision and cleanup of the coolant plumbing. Instead of a thick 131 square inch radiator I have a 225 square inch thinner radiator with, I think, better air and coolant flow. Notice the new position of the coolant pump. Now the hot water comes in at the TOP of the radiator and out the bottom. Reversing the flow this way simplified the plumbing a lot and put the pump at the exit of the radiator. I am quite sure the new system takes about 2 gallons of coolant, a full gallon less than the initial version I created in 2007, saving 8 pounds. Nice feature: the new radiator can be slipped in and out without removing the right hand headlight. 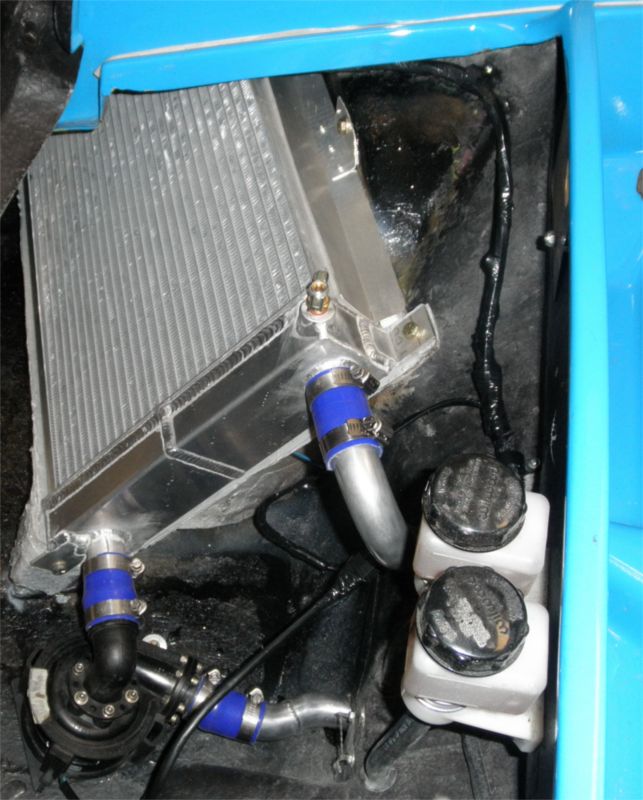 Here is the 2005 group buy radiator in place. I'll write of left and right as it appears in the above picture. (For the picture we are at the front of the car looking toward the rear of the car.) The Europa radiator is a bit different from most radiators. The water enters at the bottom (bottom right in the picture), flows across the bottom half to the left, up the left side tank, and then back right to the upper outlet hose. So the inlet is on the bottom and the outlet on the top! The right end tank has a baffle mid-way so water is forced thru the small tubes, it cannot go up the right-end tank to the outlet. The screw-in temp sensor then has to be toward the bottom of the right tank so it measures the incoming (hottest) water temperature. The radiator cannot be removed or replaced without removing the nearby headlight (it's not in the picture, but it is very close indeed)! And the protective steel shell of the headlight pod had to be bashed in a bit so the radiator would fit. This interference fit is not new, it is just a bit worse with the new radiator (as compared to the stock radiator). But by 2012 and the story was not so good. 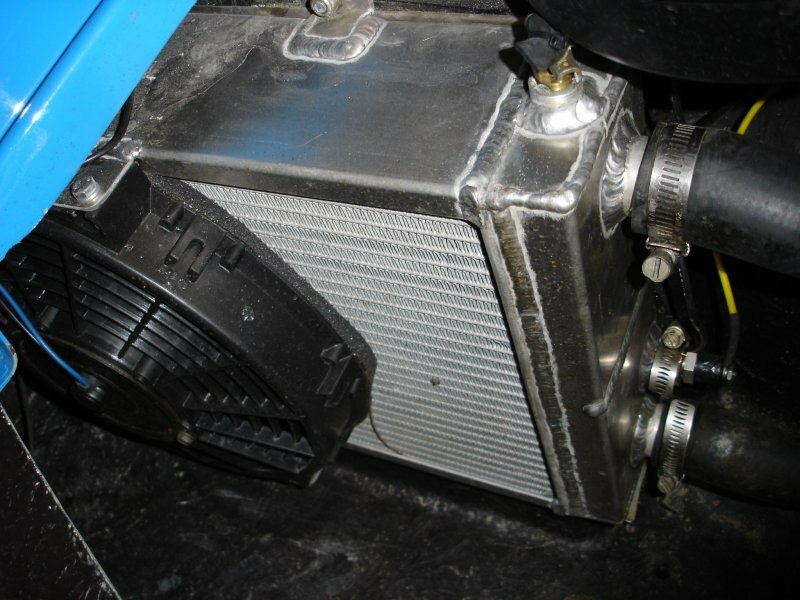 All of us with TwinCams or Zetec or Duratec are either overheating on track or have already changed to a bigger radiator. Notice all the track-capable radiators in Elan/Europa are over 200 square inches in fin area. The radiator fans all seem to weight the same, 3 pounds, so left out of the table. Standing the 3 Europa radiators (first 3 below) up and filling with water I note the AFCO radiator fills much more readily, the tubes seem to flow water more easily. In this table measurements are inches and weight is in pounds. The coolant water is circulated by a Davies-Craig EWP-80 electric pump. As of 2017 the water pump has a blank cover (from DunnellEngines.com) and just a hollow inside. As of June 2013 the pump is repositioned and of course the radiator is much larger. A much cleaner setup with much better cooling capability. As of June 2012 the electric pump is controlled by a Davies-Craig digital controller (Part Number 8020). UPDATE: October 2011: The plastic left after removing the vanes eventually shattered inside the pump and probably blocked some water flow. This was discovered on stripping down the engine looking for a bad bearing. But there was no bad bearing, there were just really long-lived bubbles in the oil that confused me. The stripdown did help as the broken plastic pump remains could then be removed! Don't make the mistake I did: remove the plastic inside the pump entirely if you remove the pump vanes at all. The Ford thermostat housing is a very nice plastic item. Because it's Ford designed one is guaranteed it will work well. The top has a 1/2 inch pipe thread fitting for the ECU's temperature sensor and a small water-bubble-elimination pipe sticking up. On the bottom (and invisible in this picture) is another fitting for a temperature sensor, here I screwed in the stock TwinCam sensor and wired it to the dashboard water temperature gauge. There are three main water outlets to the thermostat. The big one with the blue silicone hose is the main coolant path. Because the Davies-Craig runs all the time the thermostat has a couple holes drilled in it to provide a low-volume path even when the coolant is cold. The lower-left outlet is constricted as the thermostat opens by the Ford thermostat itself: this outlet is intended for the coolant-return (I think) to the water pump, a short-circuit so the engine warms up fast. Currently this outlet is not connected, it is plugged. The lower-right outlet is intended for a water-heater system (I think). Currently this is also left plugged. 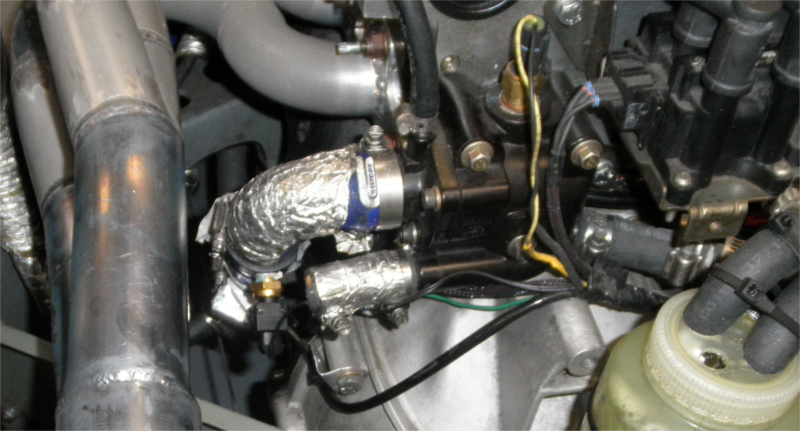 I used bits of 3/4 inch coolant hose and manufactured small aluminum plugs on a lathe (with circular grooves on the plugs so they can be easily and firmly retained by the hose clamps). It's not obvious, but all the hoseclamps on the large hoses are the special sort for Silicone hose. That is, they have smooth steel on 100% of the internal circumference so the hose won't squeeze through the slots. pegasusautoracing.com has the silicone hose and the special hose clamps. 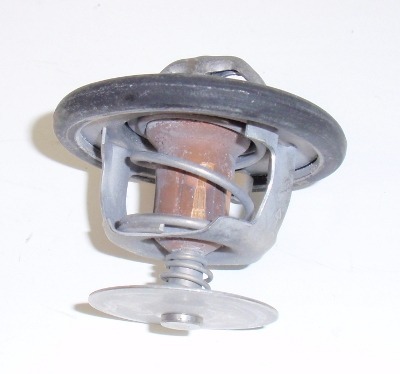 The following is a stock Ford thermostat. As of January 2013 it is no longer used. Removed from the housing. 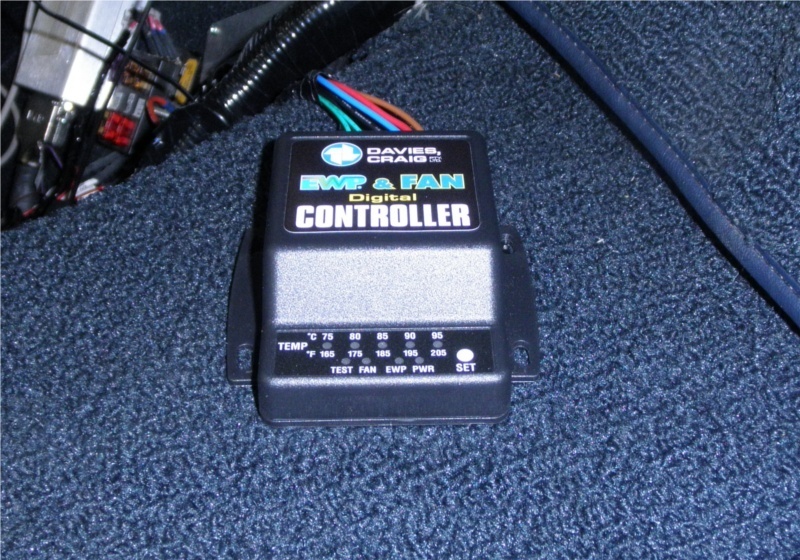 Instead, I use a Davies-Craig digital controller to control the electric water pump and cooling fan. Notice the plate on the stock thermostat, as that is what moves as the thermostat opens and closes one of the housing openings a bit. I removed this one from the car and replaced it with a thermostat rated to open at 170 degrees (ZXTuner.com partnumber 1231) during the period where I used the thermostat (2007-2012). The following picture shows the fill tank and the coolant recovery tank. The aluminum shields are absolutely essential. One prevents the exhaust from heating the coolant, the other prevents the recovery bottle from melting. In 2012 there a small change was introduced with the EWP controller. The hot coolant is piped from the engine through a temperature-sensor for the EWP controller (which has an LED warning light on the dash) and then through a surface-effect temperature sensor for an additional (bigger) warning light in on the dash. 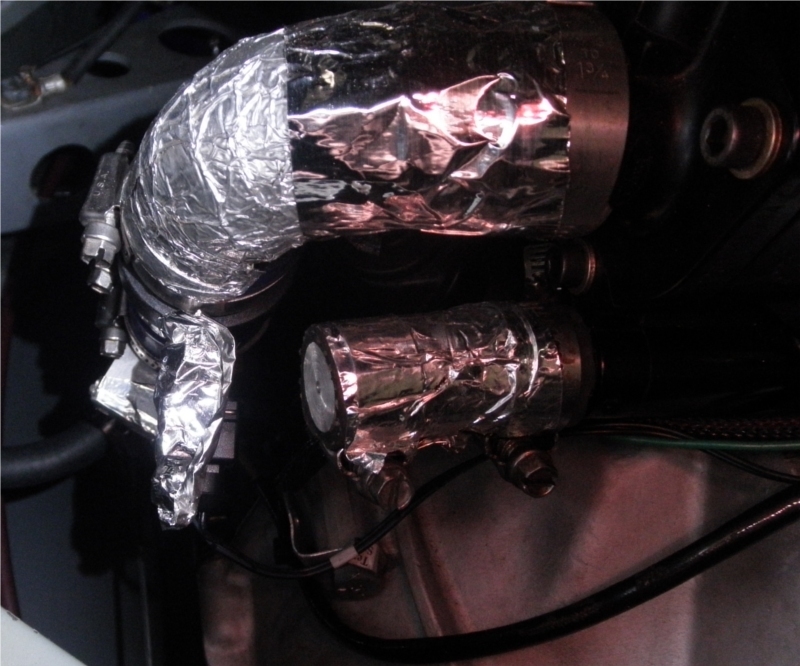 Things are covered with reflective tape to keep the exhaust from transmitting much heat to the water. The following pic is of the outlet around 90 degrees and then down. 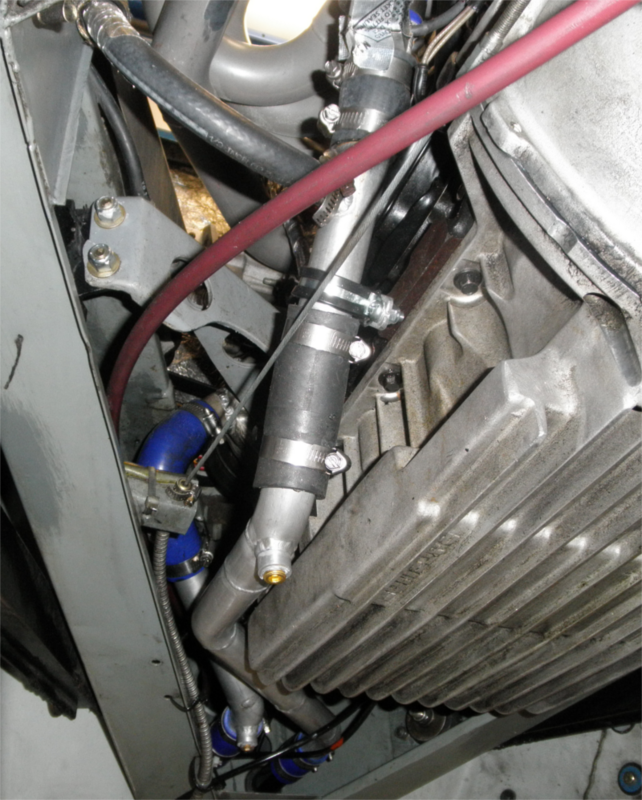 The following is coolant pipes from engine forward into the frame. Notice the brass plugs at the low points. Making it possible to drain the coolant without getting liquid all over the place. The Davies-Craig sensor and independent sensor do not show well below. The independent sensor is a surface-effect temperature sensor, a REVEFC32 from BurtonPower.com (just used to power a red light on the dash). Burton Power calls it a fan control, but it is really simply a sensor in a tubular housing and nothing sticks into the coolant flow (the 32mm size is identical to the stock 1.25 inch coolant tube size). A very nice item. The following is the EWP controller itself. Held to the carpet at driver's elbow by hook-and-loop (the carpet is the loop part). The following is the dash panel relating to water temps. Temp gauges rotated so things are acceptable unless a needle goes to the right of vertical. The sensor red lights are on the black panel which replaces the radio. The bigger red lamp is the independent temp sensor, the tiny red lamp is an error sensor from the EWP controller. The white lamp is a knock sensor warning. The mechanical water pump no longer pumps water. I removed the pump drive and installed a simple plate from dunnellengines.com in its place. Europa relies entirely on the Electric Water Pump. I will needed the heater for comfort in winter, even our mild winters here in San Francisco. I have a valve, RabbitParts.com 171819809E, which works nicely to control the flow. Of course it is critical to ensure there is a pressure differential from one end of the heater hose to the other end else there will be no flow!